Tales from a summer camp...: My final plea to the organizers of the Asifa at Citi Field: BRING BACK LIPA! My final plea to the organizers of the Asifa at Citi Field: BRING BACK LIPA! will not only unify Klal Yisroel but might also right a historical wrong. Ever since the first Asifa ad, the focus of this event has been very vague. We were told it was about the dangers of the Internet but no information was provided besides the slogan of “we can't live with it, we can't live without it.” The latest ad says even less about the content: “All the gedolim will be there, so why not you.” I’m unsure if all the gedolim will be there, but even if they will, most people don't feel we need an asifa for the sake of an asifa, especially since the Siyum Hashas is around the corner. The new plan of bussing in all the Yeshivos for free sounds fun, but do they really need to lose so much time in order to attend another shmooze? Is there no other venue to sell filtering products other than this live expo? With the way the media will portray us and the counter demonstrations outside Citi Field, this event, which may have had good intentions, will most likely turn out to be a chilul hashem of immense proportions. However, canceling the event is out of the question because a large fortune of money has already been spent. The stadium has been rented and the production companies have worked hard to set the event up. Yet I believe we can still salvage the situation and make this an asifa worth attending, by changing the focus with one simple act: BRING LIPA BACK! Let's face it, if anyone can sell tickets it's LIPA. But this is not about Lipa. You can bring MBD, Avrom Fried or whomever else you like. This is not to say the gedolim should not be there, of course they should. Bring ALL the gedolim from across the orthodox spectrum. Invite some old time great singers, like Ben Tzion Shenker and David Werdyger, so the older crowd will enjoy it too (you can lower the speaker volume in their sections). The ad say this is an event for “shtreimels, black hats and even those without hats” but why stop there? Bring the guys with kipot srugot and with those colorful yarmulkas. Sephardim, Ashkenazim and everyone in between. Invite every yeshiva boy and Bais Yaakov girl (separate sections of course). Bring the “kids at risk” and even the ones we call “off the derech.”, Just don't label the sections! For the first time, lets bring every Jew together: Yeshiva and Yeshivish guys, Chofetz Chaim, Modern Orthodox, Ultra-Orthodox, FFB’s, BT’s, Misnagdim, Chasidim, Both Satmar Rebbas, Chabad, Heimish, Chareidi, post-Chareidi and all the new ridiculous terms we came up with over the years. And because its May 20th, Yom Yerushalayim, let's bring in some war heroes from Eretz Yisroel, those who risked their lives for Klal Yisroel in 1967. Yes, bring them all. Let's have a real aguda achas for once. Lets face it. Who wouldn't want to see Roshei Yeshiva from across the board dancing with every possible type of Jew? 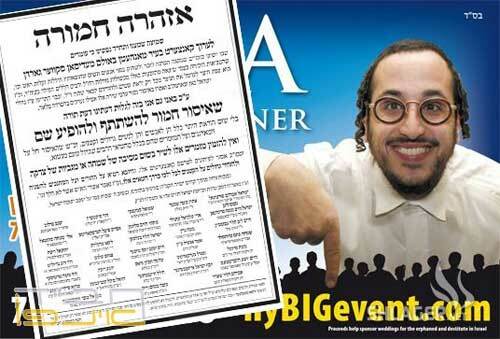 Who wouldn't buy a ticket to see Chaim Dovid dancing with Rav Matisyahu Salomon? I, for one, would pay any price. And maybe with this surplus of money we can pay back the individuals who were hurt a few years back. It was five years ago that a BIG EVENT turned into a very sad event for Klal Yisroel. A major concert that was going to take place was ruined by a few askonim. A ban letter was published days before the event which had been planned months in advance. I remember it very well because the event organizers came to my father, Rabbi Eli Teitelbaum Z”L for guidance. It was too late though because the damage had already been done. Those involved took the high road and cancelled the event. A huge amount of money was lost and it was never recovered. It was a true Chilul Hashem. But maybe now we can fix this wrong. This Asifa will take place during the days of Sefirah, where 24,000 (approximately half the capacity of Citi Field) students of Rabbi Akiva were punished by death just for a lack of mutual respect. Is this the time that we want to cause more controversy within Klal Yisroel? You can still have the expo, except let it be an expo showcasing kosher internet sites. Let vendors that have been trying so hard to produce great kosher web sites show their products to the public. Yes, we need filters. Filters that will remove all these new terms we have introduced. We need filters that will remove those Jews who act with brazen disregard and create such a Chilul Hashem. We need to expose our children. Expose them to other types of Jews. But most importantly, we need to get rid of all these Jewish subdivisions which are meaningless anyway. So let us make this event count, let us bring Klal Yisroel together and not apart. And maybe, just maybe, Moshiach will join us too. Otherwise, we can pray, scream and plead to Hashem but it won’t do a thing. We can again cry crocodile tears this Tisha B’av and then wonder why Moshiach has yet to come. Or we can do as G-d tells us and remove the sinas chinom from amongst us and then we can finally build the third, the eternal Bais Hamikdosh! Its a win-win situation. Count my family and my campers in! Which Asifa would YOU rather attend? Dovid, the pre-asifa EXPO has been cancelled, don't know if you're aware of that. I am voting "other "
I am keeping away from the whole thing. Damned if I do, damned if I don't. I'd rather do the wrong thing via shev v'al ta'aseh then via kum v'asei. I will not be coerced to attend and I will not waste my breath with counter-rallies and such. Instead, I will quietly go about my business, trying to be nice to everyone. If a neighbor asks me if I'm attending, I'll smile and make believe I didn't hear him and then get very busy with something else, fast! yup. I am on board with you. Real true ahdus. Dovid, you got it and I wish many others will join you. They will definitely get the crowds and will accomplish alot. Spread the word. The internet is powerful and you can use it out for the good to get this message out. RIVKY, you think you have to accept what teitlbaum is saying, he is a a big letz!! To be honest that's probably where I will be too. Sounds like blackmail to me. You sound like one of those people that says let's not talk about so and so because it's Lisbon hara. That's a cute idea but just as bad. You had many years to confront my father when he could defend himself and I'm sure you would have the backing of hatefull blogs. If you think that I'm trying to insinuate that I don't have any faults of my own then you are mistaken. But if you think your going to blackmail me think again. "S. Lonner," I don't know you, I don't know R. Dovid, and I didn't know his father. I can't believe anyone could write that -- that an adult, literate human being (leaving "Jew" out of it!) would not realize how making such insinuations in public about someone's deceased father only debases you -- no matter what the facts might have been. I hope there's a mussar hotline where you live, because your neshomah urgently needs resuscitation! Thanks Dovid. even though it probably will not work, it still put a smile on our faces. Keep writing no matter what anyone says. Whoever is posting against Dovid, do you feel as if you're any better than him? Despite the fact that he is helping a lot of people feel better about this asifa; if you happen to think he is doing something wrong, do you think you're being a "better Jew" by saying something derogatory about another person? One thing i don't understand is how some "extremely frum" people get to choose about what they want to be frum about. They're all into what das torah says but I don't recall ever hearing any of the gedolim say it's okay to put another person down... especially in public... especially without a good purpose (a real purpose, not your idea of if what he is doing is right or not). The way you talk really turns some people off. If you're really into 'not making a chillul hashem' then don't be the one that makes other Jews disgusted. It's not fair to people and it's not fair to you when it's your turn to get judged. Lonner, are you the one who was in prison for trading child pictures ? Shame on you! I have only a small comment; don't really have an opinion on the main issues. You write "Bring ...and Jo Amar." Jo Amar z"l died about 2 or 3 years ago. You "joke" is inappropriate. It wasn't a joke. I didn't know. I apologize and corrected it. Teitelbaum, I really appreciate this post. For it proves that you're nothing more than a letz and a mocker of everything that us charedim believe in. Keep up your good work, cause with every such post, you're just proving how uncharedi you are. BTW I missed out a couple of points I am going, because most Gedoilei Yisroel of our time signed,and even though I have questions I don't want to be mevazeh them. Another point is music is a problem in sefirah, even voices over loudspeakers according to many poskim. You have my email address so you could contact me. Dovid, if you continue to get vicious comments here, feel free to put in some sort of moderation to FILTER them out. You seemed to be speaking from the heart. If I can help you in any way let me know. BTW most never signed. Call the ones you respect and ask them yourselves. I hope you don't mean me, I do have respect for the Torah & Torah scholars.ain lecho zoken eloh beyomecho. This what we have & deserve, they are more choshuv than me. take a look at the kamtza & bar kamtza Gemorah. It seems that the gemorah balims R' Zecharyah B"A for the golus & churban, as for Bar Kamtza the instigator, the Gemorah say come & see the power of shame taht HKB"H helped Bar Kamtzah, etc. Being more choshuv carries more responsibilities, being a mahig even more. To get it right takes sityata Dishmayah & zechus horabim. It is possible that may be the intention of the meeting to have zechus horabim & get it right, I hope & pray that it doesn't end up a kamtzah & bar kamtzah. When they meet they may get the siyatah D'ishmayoh to see what the effect is & how to treat it, not only the cause, hopefuly they will. My earlier post was questioning, not chas veshalom degrading, and no one personaly was intended. He didnt mean you. Read some of the other comments. I agree, but you can scan the comments and find some vile schmutz among them. We need to teach our community to love yiddishkeit and because of that to choose to make healthy choices to, on our own, without coercion, filter out the bad stuff coming at us through our eyes. If only that's what would be happening at this assifa. I highly doubt it. time that we want to cause more controversy within Klal Yisroel?"" Here we have a camp directer who is suppose to be a role model for kids and all you do is mocking something that many rabonnim and roshie yeshivas are calling for people to attend.Here you are preaching others to have mutual respect while at the same time it is you who is divisive.Post after post its all about making fun of something that gedolai yisroel asked klal yisroel to do. Personally i don't think this asifa is going to bring the results that they hoped for.But i wouldn't publish jokes about it on a blog.At least you are honest and write lushan hora and mockery with your real name.But at the same time it also shows that you have no shame. Im sorry that you feel my post is a joke and a mockery. It isn't that at all. If you mean that this will never happen then im sorry but we have no hope for the Geula. I cannot respect any Gadol that is backed or even joins with a man like Rabbi Gotlieb. Shame on these Rabonim. Shame on Klal Yisroel for allowing this. Shame on you for not believing we have a chance for Moshiach! "Say the nincompoops in charge of this thing succeed"
Nebech that you feel that you are doing a good thing with your rambling. You are twisting my words or you cant read I said "ANY Gadol that stands by Rabbi Gottlieb". Please stop posting if you cant take the time and read what I wrote. But as we all know, all the rabbonim backing the asifa in essence stand by R Gottlieb, so yes, you said shame on all those rabbonim. I think he is referring to the organizers behind the big event, and nincompoops might be a compliment for them. I think you have an excellent suggestion, and I am still hopeful that Lipa will be on stage this Sunday. But perhaps they could also give out copies of the books "My Uncle the Netziv" by the author of Torah temima, and "The Making of A Gadol" which were banned by the same crew of ignoble censors? Dovid,look at your followers, 43 voted for the counter rally! Look what you did! Hashem yiracheim!!!! You will give din vicheshbon for this!!! You made such a chilel kvod shmaim!!! I hope the Torah leaders put you in CHEIRIM!!! Um. I wasn't promoting the counter rally, I was just asking who is going. Its the leaders you refer to that caused the counter rally by not dealing with our problems in house. And please put me in Cheirim I heard that's great for publicity. You horrible person! How can you say things like that in good conscience? There is something called respecting the dead. I think you have got to take your own advice, and learn some self control and quit the Chutzpah! Hey Dovid I really respect what you are doing. Your an inspiration and a light in a black tunnel. I am one of those kids that are classified as "off the Derech". All the comments that I read are the reason I left the Frum community...I still believe in Hashem and try to do the best I could which might not mean following the whole Torah at this time in my life. I like to consider myself a good person. Problems in the Jewish community exist just like they exist in every other community in the world. The difference is a lot of us feel we have this image as being perfect and have to keep up that image. Therefore we sweep all the garbage under the rug. This will not make the garbage go away we just end up having a huge pile of garbage under our rug. And it is very uncomfortable to live with all this garbage. What we have to do is work on cleaning up this garbage and getting rid of it and make ourselves good people instead of making believe we're good people, for all the "goyim" to be jealous of. Thank you Dovid for having the courage to speak up, and trying to get rid of the garbage. God Bless You!!! Thank you so much. I thought I was wasting so much of my time with this blog. I just want you to know there are great Rabbis out there, they just dont get the podium. Ignore the idiots and move on with your life.